So writes Dr. John Piper on the back cover of this small, but robust collection of essays on the life and theology of one of the most well-known Reformers: John Calvin. Written to commemorate the 500th birthday of Calvin, this collection, written by some of the finest Bible teachers of our time, is probably one of the best introductions to Calvin, his life and thought out there to someone who is unfamiliar with him. Calvin has been subject to many caricatures and misrepresentations, as is the system that is named after him, that have over the years made him an obscure and vilified character. But this book, written by men who have gone straight to the horses’ mouth shows a different side to Calvin. It shows him as a humble man, a caring pastor, counselor, a stalwart theologian, devotional writer, prayerful and passionate man. Throughout the book the man himself is quoted many times from his own writings to show how he himself taught a doctrine. Some may be surprised that this is not a book about Calvinism. It’s not a book arguing that point, though this system does make it’s appearance, as it is necessary. The doctrines are introduced for those who may be unfamiliar with them, but they are not the central focus of the book. The various controversies surrounding the doctrines that Calvin taught are also discussed, but usually in a matter-of-fact manner that stays clear of smearing and mockery. 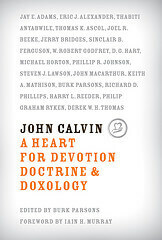 All in all, I enjoyed this book, as it gave another look at Calvin the man. After reading With Calvin In The Theater of God a couple years ago, I began to appreciate the Reformer for the expositor and pastor that he was, this book only enhanced that appreciation. Most of the chapters are written by pastors, who deal every day with the pains of their flocks, and in their study and reading of Calvin have seen how he expressed his pastoral concern over matters of counseling, and matters of doctrine. I think there’s something we can all learn from this book, looking back on a man who lived over 500 years ago. Is Calvin perfect? No. Is Calvin the only person who could interpret Scripture? No. He made mistakes, he made bad decisions—but he was human, what are we to expect? That does not mean we cannot learn from the life and writings of Calvin. I think this book, will help whet your appetite for learning more from this Reformation leader.